March marks the start of Women’s History Month, a time reserved in which women’s achievements and contributions to this nation are highlighted and celebrated. This month as we look back and remember the great women of the past such as Elizabeth Cady Stanton, a New York social activist, abolitionist and a leading figure in the early women’s rights movement; Harriet Tubman, a former slave who returned to the south to lead hundreds of other slaves to freedom through the Underground Railroad; and Susan B. Anthony, a women’s rights leader who helped lead the way for women’s right to vote, Alabama Launchpad also salutes women whose work and innovations have improved lives. The women saw a need and had the creativity and ingenuity to come up with a way to solve and improve that need. Among them are Margaret Knight, who was dubbed by journalists in the 19th century as “the lady Edison” and was awarded 27 patents in her lifetime for inventions, including a safety device for textile looms; a shoe-manufacturing machine; a “dress shield” to protect garments from perspiration stains; a rotary engine and an internal combustion engine, according to Biography.com. Another inventor is Katharine Blodgett, whose work in chemistry at the molecular level resulted in non-reflective glass, which was used for camera and movie projector lenses, and today are essential for eyeglasses, car windshields and computer screens, according to Biography.com. Many years later, we realize women are still at the forefront of invention and innovation, taking risks to bring ideas to maturity. That’s why in its 10 years of existence, Alabama Launchpad, a program of the Economic Development Partnership of Alabama, is proud to have invested in women-led startups such as Archangel Systems Inc., a small company in Auburn owned by Kitty Greene that specializes in the development and sale of inertial systems for the military and aerospace industry. Archangel Systems is one of the company’s to receive a grant through our Alabama (SBIR/STTR) Small Business Innovation Research and Small Business Technology Transfer Program. We’ve also funded Skills For Success, launched by Crestline Elementary School teachers Libby Pittman and Amy Dern, which develops products to teach children basic life skills, including Fearless Fire Drills, through our startup competition. We also have invested in Alignment Simple Solutions, headed by CEO Tess Winningham, which manufactures QuickTrick Alignment Tools – designed to improve performance, lengthen tire life through early and fast diagnosis of wheel alignment issues on any vehicle. GeneCapture, a startup at HudsonAlpha Institute for Biotechnology in Huntsville, was among the early companies funded by Alabama Launchpad. The company is developing a device that can detect a known expressed gene or nucleic acid in less than an hour. Peggy Sammon, who has served as an Alabama Launchpad Startup Competition judge, is CEO. Blondin BioScience, co-founded by Dr. Katri Selander, is a team of expert scientists and business professionals driven to dramatically impact how cancer is treated, decreasing the cancer burden for patients, physicians, and insurance companies. Cheeriodicals, founded by Mary Martha Parisher, creates get well soon gifts that are personalized, memorable and designed to bring cheer to anyone. editBioMed, founded by Melanie Styers, PhD, offers professional manuscript editing by scientists for scientists. Exscien Corp., co-founded by Christine Chancery, is a biotechnology firm that develops drugs to repair damage to mitochondrial DNA, will provide the first available treatment for diverse and common diseases, ranging from organ transplant to multi-organ system failure. In the Sports Zone, founded by Darla Hall, creates sports team activity books and apps for families and fans of all ages. Nutripilot, founded by Melanie Rubery, is a web-based platform to help navigate individuals to healthier food choices. Swell Fundraising, formerly Smart Party, founded by Brooke Battle, helps organizations create more dynamic events that maximize giving and draw new donors. MetaboloStasis Therapeutics LLC, founded by Tracy Nevitt, drives research towards therapeutic solutions for the treatment of rare disorders of copper metabolism. They are the many examples of women who have taken advantage of Alabama Launchpad programs as they work to bring their breakthrough ideas to the market. Throughout March, Alabama Launchpad will highlight women-owned startups and women leading startups in Alabama on its social media accounts. Women are important to society. 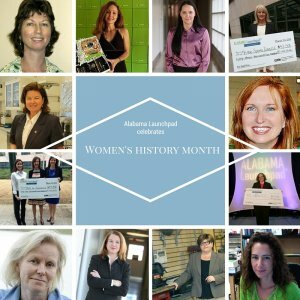 Women’s History Month and Alabama Launchpad honor that. Check out our Startup Competition success stories and our Phase 0 assistance success stories.